Few edibles have deeper roots in Tennessee than moonshine and BBQ. One Murphreesboro, TN company is blending those two Volunteer state staples with undeniably delicious results. Moonshine BBQ Sauce Company produces four different sauces, each with the unique kick of Tennessee moonshine. I've been asked to review Moonshine's Hot BBQ Sauce. Moonshine sauces are appropriately packaged in pint (16 oz) mason jars. A few scattered pepper seeds can be seen floating in the smooth, bright red sauce.It's on the thick side, but pours quickly from mason jar's wide mouth. As soon as I cracked the seal on the first jar, it was evident that Moonshine wasn't your average sauce. The potent aroma was dominated by the smell of chili powder. In all my time sampling and reviewing sauces, I had never encountered anything that smelled quite like it. I was really interested to see how this would translate to the sauce's flavor. Like most sauces, the initial flavor was sweet. However, sweetness was not the dominant element. Savory spices like garlic, onion and chili powder also stood out. The inclusion of moonshine gave the sauce an additional Tennessee tang. This version also includes spicy finish. I used the sauce both as a dip and a glaze. Additionally, I cooked with the sauce on a couple occasions. While the thick sauce was tasty as a dip, I found it best used as a finishing glaze for ribs. Unlike many other sauces, Moonshine didn't seem to lose any of its bold flavor when hit with high heat. If anything, the flavor became even more robust. The kiss of an open flame really seemed to do wonders for the sauce. Another great thing about Moonshine BBQ sauce was how it glued to the meat. I brushed it on thick and enjoyed the sticky, finger licking goodness. It's always a treat to review a sauce that breaks convention. The flavor profile of Moonshine Hot BBQ Sauce is totally unique. I give it high marks for originality and expertly blending spices. 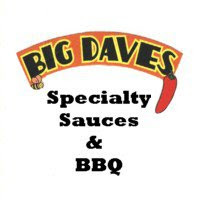 It may not be what you expect from a BBQ sauce, but sometimes that's a good thing. 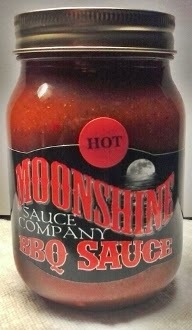 Moonshine sauces can be purchased online HERE. 1 Response to "Moonshine Hot BBQ Sauce"